AnimSchoolBlog: New Character Rig: Marco 2.0! New Character Rig: Marco 2.0! Marco is AnimSchool's new pretty-boy character rig. He has two complete outfit changes and two hairstyles to choose from. Students can mix and match the shirt, pants, shoes, as well as hair to get a unique look. AnimSchool's new character Marco is a new favorite among our animation students. Our students use Marco in our feature animation classes 5-7. Marco was carefully crafted over a long period to ensure appeal and versatility. Marco represents a new initiative at AnimSchool, using detailed texturing, while still maintaining a simple look. Marco looks great in Maya's viewport too, taking advantage of Maya's Viewport 2.0 stingray materials display. 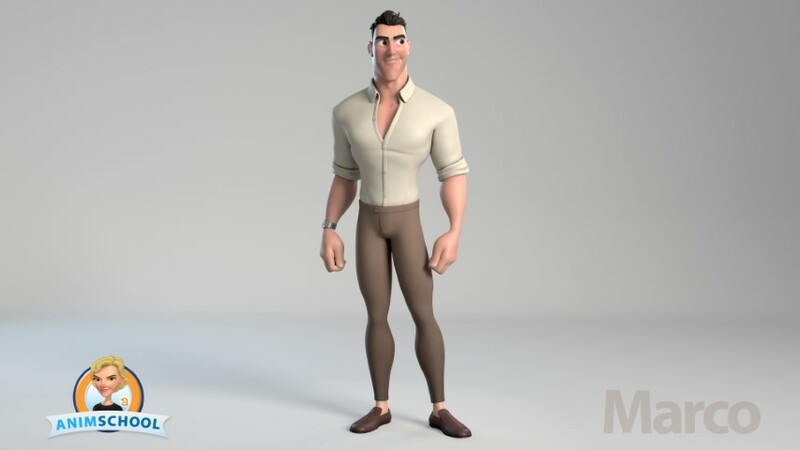 Marco was designed by artist David Lojaya and modeled by Dave Gallagher, Jacob Van Valkenburg and Paul Bellozas, rigged by Dave Gallagher, and textured by and Paul Bellozas. To apply to be a student at AnimSchool go to www.animschool.com. Come join our animation classes to learn with AnimSchool rigs!